No matter what industry your business falls in, there's no shortage of supplies your company will need to run smoothly and efficiently — towels included. From gyms and fitness clubs to salons and spas, washcloths are a must-have for your employees and customers alike. You want to invest in the amenities your business deserves, but you don’t want to break your budget in the process. That’s where our wholesale white washcloths come into play. At Towel Super Center, we’re proud to offer our towels to you at an affordable price. Don’t wait for a sale to roll around elsewhere — invest in the first-class hand towels you and your customers deserve today. Restaurants: When brewing up a delicious meal, it’s easy for the kitchen to turn into a messy array of tomato sauce drippings, oil blotches and potentially slippery floors. Turn maintaining a clean kitchen into a simple task by investing in our 100% cotton fiber wholesale washcloths. With their fast-absorbing properties, they’ll mop up any unwanted spills and leave only pure cleanliness behind. Gyms and Fitness Clubs: Invest in a gym towel that works as hard as your clients do! When your guests go to the gym, working up a good sweat is priority number one. Once they’re done exercising, it's essential to mop up any excess wetness or moisture to leave the building feeling dry and fresh. Store these towels in locker rooms, or offer them at the entrance for added convenience. Salons: In an industry that revolves around constant washing, coloring and cleaning, it’s no wonder towels are an essential accessory for every salon and spa! Allow your guests to dry their hands, face and body with soft plushy towels that even those with sensitive skin will enjoy. Hotels and Resorts: Every hotel owner knows how important it is to line each room with a fresh set of linens, bedding and towels. When your guests walk into their room, exceed their expectations with a snowy white towel they can dry their hands on after showering and bathing. These clothes are sturdy and quick-wicking, as well, so you won't have to fork out more cash for extra laundering or replacements. Car Washes: After washing their car, make sure your patrons drive off your lot in a dry and shiny car — not a wet and dripping mess. Use our towels to dry off any leftover water or residue. Your employees will enjoy the softness of these compact towels while using them, as well. You don’t have to be a business owner to enjoy the benefits of 100% white cotton hand towels. Line your home with these washcloths for the perfect accessory designed to complement any kitchen, bathroom or pool. At Towel Super Center, we believe quality doesn’t have to come at an inflated price. Enjoy the benefits of superior quality towels without dipping into your savings in the process. 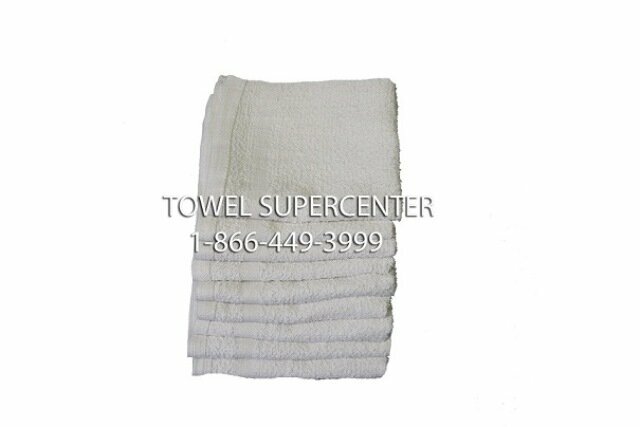 For wholesale towels your employees and customers are guaranteed to love, browse our products and place your order online at Towel Super Center today!